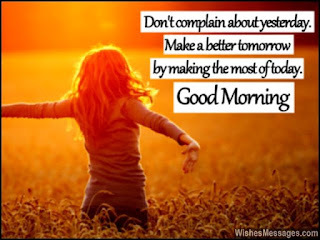 Morning Motivation Morning motivation - Don’t complain about yesterday. Make a better tomorrow by making the most of today. Morning motivation - Don’t complain about yesterday. Make a better tomorrow by making the most of today. 1) Being happy or sad, gloomy or excited, moody or stable… are options that are presented to you every morning. You just have to make the right choice. 2) It is good to dream big but your dreams will never see the light of day if you sleep big too. 3) Wake up and face life’s challenges head on. Else, life will become quite a challenge. 4) This morning is what it is because you were what you were yesterday. Be what you should be today so that you can be what you want to become tomorrow. Good morning and happy Sunday.